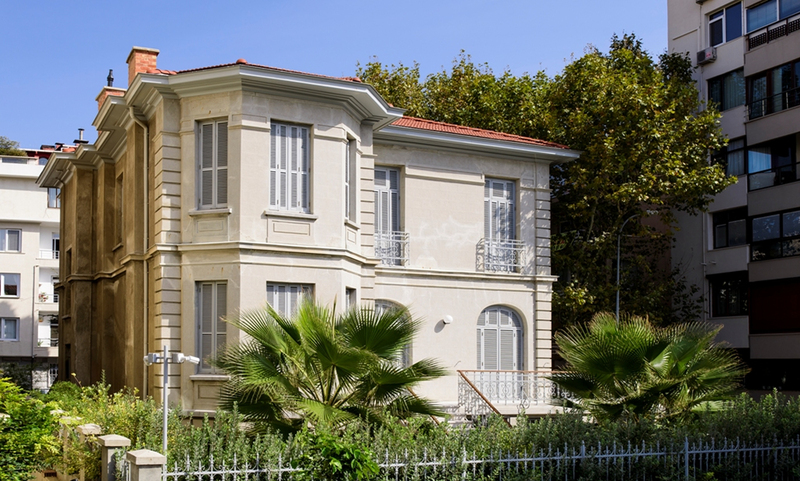 Antipa Mansion was built by Architect Constantin P. Pappa for Dr. Andrea Antipa at the beginning of 20th Century. Although the year of construction is not known exactly, it is estimated to be built in the period of 1906-1914. Starting from that day to 1971, Ferit and Müfide Tek lived in the mansion. After Ferit and Müfide Tek passed away in 1971 the mansion was evacuated in 1973 and the driver of their daughter Emel Esin used the mansion for a while with his family. After the death of Emel Esin in 1987, Tek Esin Turkish Culture Research and Development Foundation was founded in 1988 upon her bequest, and two years later the ownership of the mansion was transferred to the Foundation as per Emel Esin’s will. The building, which was not used after that day, was hit by the first fire in 1992, and the wooden stairs and wooden wall covers of the living room located at the entrance were damaged. In the second fire, which hit the mansion in the second half of 1990’s, the wooden roof was damaged. The building was exposed to weather conditions until the restoration efforts were initiated in 2010. The building was almost ruined before the restoration; internal plastering was damaged, and wooden structures were deteriorated. There were damages in the load bearing walls and tiling. Since the existing bearing system was not sufficient to resist the earthquake, the building needed retrofitting. On the other hand, since the plaster covering in the external front was a characteristic example of the plaster artisanship of the first years of 20th Century, it was important to preserve it. For this reason, to resist a possible earthquake, a rigid core structure has been designed; composed of concrete internal walls and tiling, and front walls were supported by this core. The external walls have been strengthened by injecting reparation mortars into the cracks. Wooden roof and wooden eaves have been reconstructed. The plan of the ground floor has been preserved, and wet spaces were included to the seaside bedrooms of the first floor. In the basement, a spacious area was created through wide openings in the walls of the two rooms by the sea opening to the hall. Wooden eaves and joinery were produced as per the preserved original samples. Existing Current iron joinery and iron bars were repaired. During the restoration, a new staircase has been designed. Restitution of the already destroyed wooden staircase by imitating the examples from the buildings of that era was especially avoided. The renovated wooden works of the building passed the details of the first years of 20th Century to the next century but it was impossible to transfer this information to next generations through an already demolished staircase. Furthermore, the traces of the staircase were not sufficient to replicate it in accordance with the style of that era. The same principle was followed in all architectural designs that did not exist in the original structure; but added to the building during this intervention. Simplicity was at the forefront in terms of materials, colors and forms, and a matching and visible togetherness was aimed at between the old and new elements. Restoration was done by Sayka Construction under the supervision of the project coordinator. Although the construction year is unknown, since the building was not illustrated in the Goad Map of 1906 and was used by a member of the army; Mehmet Ali Pasha in the years of the First World War, it is understood that the building was built between the years of 1906 to 1914. 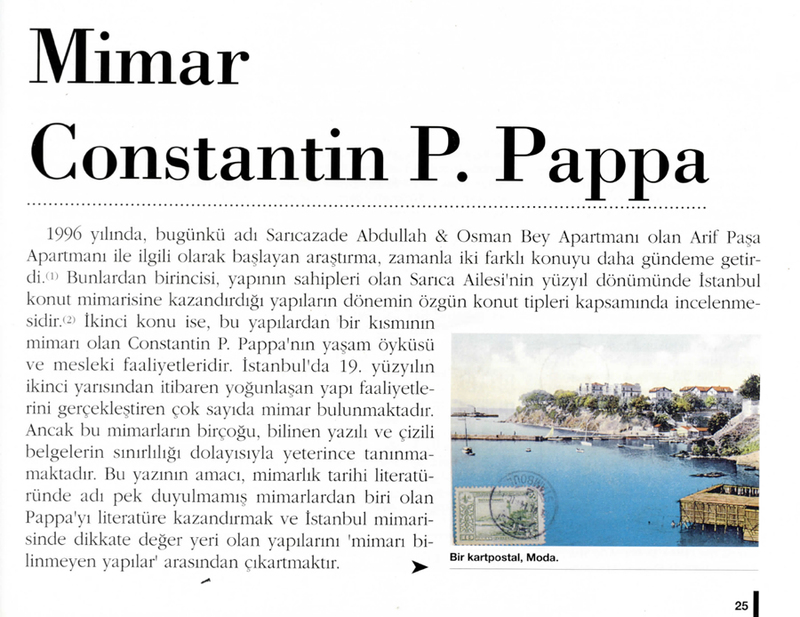 In the document kept in Kadıköy Deed Registry Office, it is written that the real estate in question was sold to Müfide Tek, by Ms. Ekaterina, daughter of Konorados Dimas, widow of late Aleksandros Antipa; a member of family of Andon Fara.